Prior to being employed at UWS, Omar Mubin was a post-doctoral researcher in Human Computer Interaction at Ecole Polytechnic Federale de Lausanne (EPFL), Switzerland. Omar Mubin completed his PhD doctorate qualification in Human Robot Interaction from the Eindhoven University of Technology, the Netherlands in 2011. He was also a visiting researcher at Philips Research Eindhoven in 2007 during his 2-year tenure as a research trainee at the Eindhoven University of Technology, which resulted in him being awarded a PDEng degree in 2007. 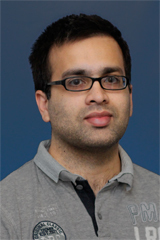 His research interests comprise of Human Computer Interaction, exploring the role of robots in education, Empirical research in Human Computer Interaction and user-centered design. He has authored/co-authored about 35 articles in peer reviewed conferences and journals in the areas of Human Computer Interaction and Human Robot Interaction.